Roman colonies are founded at Mutina, Parma and Saturnia. This year saw the death of two of the greatest generals of all time, Publius Cornelius Scipio Africanus and Hannibal. Africanus died of natural causes, probably at his estate in Liternum, while Hannibal committed suicide in Bithynia, where he had been a guest at the court of King Prusias. Just outside Rome’s sphere of influence, King Pharnakes of Pontos captured the Greek city of Sinope, an important Black Sea port. The Romans do not seem to have had any diplomatic relations with Pontos yet, but King Eumenes II of Pergamum and the Rhodians – two staunch Roman allies – were deeply worried about this Pontic aggression and would send a diplomatic delegation to Rome the next year. As a consequence, King Pharnakes did the same. By this time, the Senate seems to have been continuously occupied with discussing the situation in the Greek world, which was extremely complicated. Polybius claims that this year “so large a number of missions from Greece were assembled in Rome as had, perhaps, never been previously seen”. The complexity of the problems in the Greek world is a good reason to discuss these first. Many Greek delegations had grievances about King Philippos of Macedonia. King Eumenes and his brother Athenaios complained that the Macedonian king had failed to evacuate Thrace and was furthermore aiding their traditional enemy King Prusias I of Bithynia. And Prusias, they may have added, gave sanctuary to Rome’s greatest enemy, the Carthaginian Hannibal. A Spartan delegation had also arrived in Rome. Even though Sparta was just a small city, the delegation turned out to represent four different factions. Polybius claims that the Romans were so overwhelmed by the presence of so many delegations that it took them three days to introduce all of these in the Senate. The situation must have given the senators migraine and they certainly seem to have got lost in all the details. The Macedonian case was presented by Demetrios, son of King Philippos. His defence was clumsy, but the Senate felt a lot of sympathy for this young man, who had spent much of his childhood in Rome as a hostage. The senators decided to be lenient with regard to Macedonia, but only because of their sympathy for Demetrios. This attitude made King Philippos and his other son, Perseus, immensely jealous and angry. Polybius even claims that the famous Titus Flamininus had spoken to Demetrios in a private conversation, and had promised the young prince that the Romans would offer him the throne of Macedonia in the near future. It is impossible to ascertain whether this claim is true, but it is certainly true that Perseus believed it and later used it to get rid of his half-brother. In the end, the Senate took several decisions. 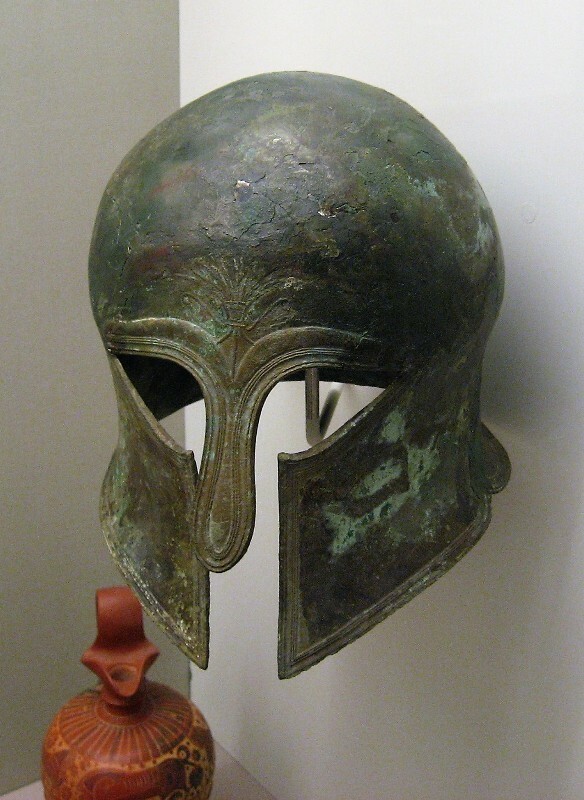 Sparta was not allowed to secede from the Achaean League. The consul of 186 BCE, Quintus Marcius Philippus, was sent to Macedonia, while a three-man delegation led by Titus Flamininus was sent to the Peloponnesos. Quintus Marcius forced Philippos to remove his troops from Thrace. The king complied, but did so “in a sullen and grumbling spirit and with many sighs” according to Polybius. He then took his army on a campaign against the tribes living north of Macedonia, such as the Odrysai. The Spartan cause was dealt a severe blow this year when a new diplomatic delegation sailing for Rome was attacked by pirates on the high sea. The last Agiad King of Sparta, Agesipolis III, was killed in the fighting. Tomb of the Scipios on the Via Appia. Although a case can be made for 184 BCE, it was probably in the summer of this year that the great Scipio Africanus passed away at his estate in Campania. An embittered Scipio had retired to Liternum to avoid a politically motivated trial against him for embezzlement. Livius mentions several traditions with regard to Africanus’ death and burial. Some sources claim that he died in Rome, others that it was in Liternum. Both Rome and Liternum had funerary monuments for him. The one in Liternum, which Livius claims to have seen himself before it was destroyed in a storm, had a statue of the great general and an inscription. Thanks to Valerius Maximus, we know that it read ingrata patria, ne ossa mea quidem habes – “ungrateful fatherland, you do not even have my bones” – which implies that Africanus was indeed buried in Liternum. But we should not rule out the possibility that he was interred in the family tomb of the Cornelii Scipiones near Rome, the remains of which still exist. The so-called Sepolcro degli Scipioni can be found in the Via di Porta San Sebastiano, just south of the church of San Giovanni a Porta Latina. In Scipio’s days, this location was a few hundred metres outside the Porta Capena, a gate in the Servian city walls. The tomb was on the ancient Via Appia which ran from Rome to the south of the Italian peninsula. Livius claims that three statues stood on the Tomb of the Scipios, two of which represented Africanus and his brother Lucius, while the third was a statue of the poet Quintus Ennius (ca. 239-169 BCE), a friend of the family. It is impossible to establish which of the two monuments was the tomb of Africanus and which a cenotaph, but given the fact that Africanus had deliberately left Rome and Roman politics, a burial in Liternum sounds a little bit more plausible. 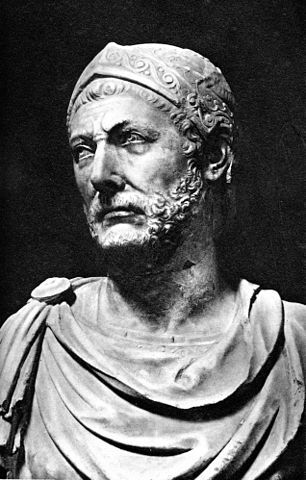 This year also saw the death of Africanus’ great rival, the Carthaginian general Hannibal, although a case can be made that he in fact died the next year. In any case, after settling affairs in the Peloponnesos, Titus Flamininus travelled to the court of King Prusias of Bithynia, where Hannibal had been granted asylum several years previously. Flamininus’ prestige was immense, and the king was loath to risk a conflict with the powerful Roman Republic. Prusias immediately sent soldiers to surround the house where Hannibal was staying. Flamininus may have pressured the king into doing this, but Prusias may also have acted of his own accord, aiming to please his Roman guest. Hannibal, noticing that his residence was surrounded, tried to flee, but found all of his escape routes blocked (Livius claims he had provided his house with seven of these). The Carthaginian then asked his servant for the poison that he always kept with him for cases like this. He had no wish of falling into Roman hands alive. Cursing the coward Prusias for breaking his word and the divine rules of sanctuary and hospitality, Hannibal drank the poison and died. The consuls for this year, Marcus Claudius Marcellus and Quintus Fabius Labeo, were both given Liguria as their province. The pontifex maximus Publius Licinius Crassus died and Gaius Servilius Geminus was elected as his successor. After his surprise election in 212 BCE, Crassus had been the supreme pontiff of the Roman Republic for almost thirty years. He had been very popular and his funeral was impressive. Meat – from the sacrificial animals – was distributed among the people and three days of funerary games were held in which 120 gladiators fought each other. The first gladiatorial games in Rome had been held in 264 BCE, and even at this point in history they were still part of the funerary games and not held for public entertainment. After the games a large banquet was held in the Forum Romanum. 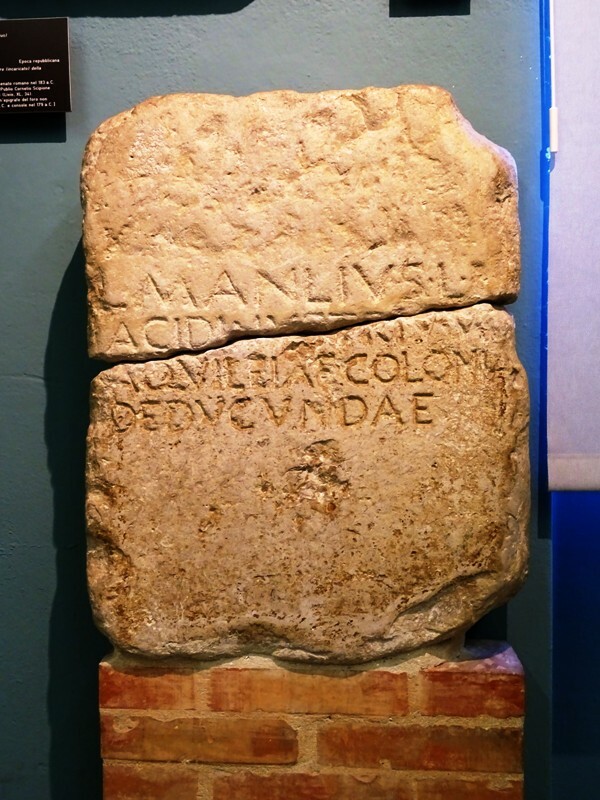 Limestone table with the name of Lucius Manlius Acidinus (Museo Archeologico Nazionale di Aquileia). The praetor Lucius Julius was sent north to confront the group of Celts that had crossed the Alps in 186 BCE and had started building a town in the vicinity of what would later become Roman Aquileia. Julius was ordered to expel them without the use of violence. His mission seems to have been a failure, because we later find the consul Marcellus in the area with his army. Although Livius claims the Celts had 12.000 men under arms, they apparently had no taste for battle against the consul’s superior force. The Celts surrendered and were disarmed, their possessions confiscated. The tribesmen complained to the Senate about the way they had been treated, but although their possessions were returned (at least those they had acquired legally), they were told to leave Italy and stay out. It should be noted that up until then, the regions now known as the Veneto and Friuli had not been formally part of the Roman province of Gallia Cisalpina, which mostly comprised the southern part of the Po Valley. The Romans do seem to have been on friendly terms with the native Veneti, at least since 225 BCE. The result of the Celtic migration was that this part of the Italian peninsula was now claimed and annexed by the Roman Republic and used as a staging point for the invasion of Histria (the Istrian peninsula in present-day Croatia). After some discussion, it was decided to found a Latin colony here – instead of a colony of Roman citizens – and call it Aquileia. The three officials (triumviri) appointed to supervise the founding were Publius Cornelius Scipio Nasica (the consul of 191 BCE), Gaius Flaminius (the consul of 187 BCE) and Lucius Manlius Acidinus, a hero from the war in Spain. Acidinus’ name is preserved on a limestone table that is kept in Aquileia’s archaeological museum. Not content with the peaceful resolution of the conflict with the Celts, the consul Marcellus wanted to march his army further east in an invasion of Histria. This was thwarted by the Senate, which decided that there was no casus belli. 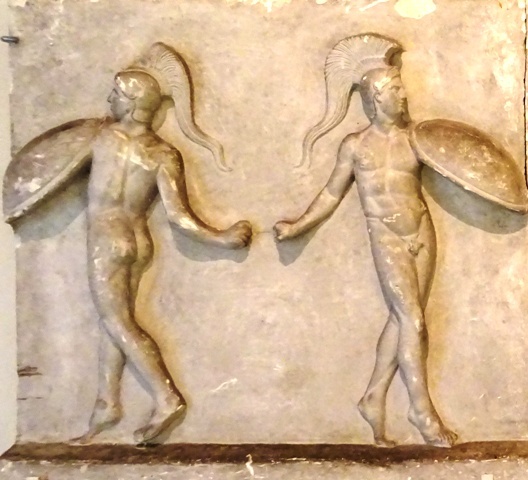 Two more important Roman colonies were founded this year, one at Mutina and one at Parma. Both were on the recently constructed Via Aemilia (see 187 BCE), the all-important road that ran from Ariminum to Placentia. Mutina (modern Modena) had been under Roman control before. It had been besieged by Celts during the opening stages of the Second Punic War and may have been captured and destroyed (the outcome of the siege is not clear). A bloody battle against the Boii had been fought here in 193 BCE. The founding of Mutina may therefore in fact have amounted to a re-founding. Another colony of Roman citizens was founded at Saturnia in Etruria. According to Livius, the consul Quintus Fabius Labeo did not do “anything worth mentioning” in the territory of the Ligurians this year. Things were pretty quiet in Further Spain or Hispania Ulterior as well. The only real fighting took place in Hispania Citerior, where the propraetor Aulus Terentius Varro led his troops against the Celtiberians. His campaign seems to have been successful and several fortified towns were captured. Perseus was several years older than Demetrios. He was the son of Philippos and Polykrateia of Argos, the former wife of Aratos the Younger. We do not know the name of Demetrios’ mother, but she was Philippos’ legitimate wife. Demetrios may therefore have had a stronger claim to the throne than Perseus, which was probably the reason why the latter always saw his half-brother as a threat.